Kim Myung-sik has never stopped making shoes. Since first entering the business when he was 13, just after the Korean War, he’s been at work. Shoemaking for him was a way of survival, and he learned the skills as he begged for meals. “Everyone was like me back then because we were so poor from the war,” Kim said, as the 73-year-old tended to some handmade footwear at his shop in Seongsu-dong, eastern Seoul. The area was once known as a center for handmade shoes as up to 1,200 shoemakers settled there. Things changed as Korea slowly began its economic ascent. Lacking high technology and capital, the country focused on light industries such as textiles and shoes. It was around this time that manufacturers like Kumkang and Esquire were born, creating a demand for skilled shoemakers. “Several companies offered me a job. Some of them even paid me in advance,” Kim said. Soon enough, his salary had risen and the work also became easier as Korea’s leather production improved. Starting in the 1970s, sales of women’s shoes began to soar as the number of women going to college or work increased. The history of Seongsu-dong is not very long, as handmade-shoe makers originally sprouted up in Myeong-dong, central Seoul. But as land prices soared, they moved to Seongsu-dong. Kim also moved here about two decades ago. “That was when Seongsu-dong was enjoying its heyday. Yeah, those were the good old days,” he said. Today, the demand for handmade shoes has dwindled considerably, he said. This is because corporations have stepped in, and as they began mass producing shoes, shoemakers in Seongsu-dong began to rapidly lose their clientele. Further, foreign designer brands stepped in, making it even more difficult for the handmade shoe companies. “I guess it’s unnecessary to say what happened next. Handmade shoes lost their place,” Kim said. Only 350 factories survive, and most of them are barely able to eke out a living. Many have opted to serve as a vendor for larger companies. “Handmade factories supply their shoes to large companies for 60,000 won to 70,000 won a pair, which is not much more than what they used to get 10 years ago,” one factory owner said. The shoes are then sold at department stores for some 250,000 won. Not helping the situation is that these large clients choose to issue promissory notes, rather than pay in cash, Kim noted. Seongsu-dong shoe merchants decided they needed to change the situation. Three years ago, they decided to start working together. Instead of selling their products at OEM (original equipment manufacturer) prices, they decided to create their own brand. That was the start of Seongsu “Sujehwa” Town. “Sujehwa” means handmade shoes in Korean. This is a joint store where 25 factories come together to sell their individual brands. The store rent is shared by everyone. “We had no chance of renting a space in a department store. Even if we did, we would be given only the darkest corner of the store,” said Park Dong-hee, chairwoman of Seongsu Sujehwa Town. The shoemakers decided to appeal with higher quality and low prices, in Seongsu, home of handmade footwear. It was not easy at first, as most merchants had no understanding of a corporate partnership. They had only distrust, as they had often been short-changed by their bigger corporate clients. But as time passed, they grew to realize the benefits of such a cooperation, especially as sales started to rise. They gradually began to open up toward one another and share information. “They seem to realize that we need to unite to survive,” Park said. At the town, shoes sell for around 120,000 won to 130,000 won a pair. “For the same quality, they are half the price of the shoes sold in department stores,” the chairwoman said. Since the town opened, the shoemakers no longer engage in painful cost-cutting. They are also less anxious about receiving orders from department stores and other corporate clients. The Seoul Metropolitan Government and Seongdong-gu office are also avidly promoting the town, leading to more media attention and visitors. “This is the third time I’ve visited this town. Though I live in Yongin (one hour’s drive away), it’s worth it because I get the shoes I want for a reasonable price,” said Kim Mi-young, a math teacher who is constantly in search of comfortable shoes because of the long hours on her feet. “I love Korea’s handmade shoes. I travel a lot, and I need comfortable shoes,” said Megan Lunn, a Harvard graduate school student who picked out a dark blue pair of sneakers. “Seongsu-dong is changing,” said Lee Bo-hyun, an executive of Suecommabonnie, a local shoe company that sells all the nation’s top department stores. Suecommabonnie has its roots in making handmade shoes, and it was recently acquired by Kolon. “It’s not only the factories, but the whole atmosphere is changing, with the streets becoming more fashionable and modern,” said Lee, who often visits Seongsu-dong because Suecommabonnie’s shoes are all made here. Seongsu had a reputation for being a scruffy, industrial district because of the run-down shoemaking shops that used to line the streets, not to mention it’s where many carmakers have R&D and repair facilities. 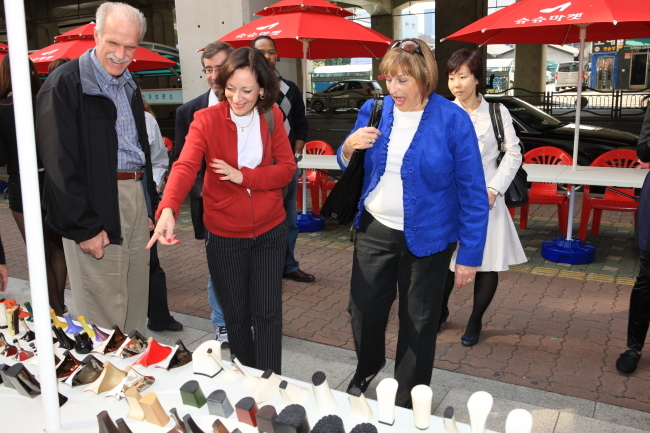 The district office hosts shoe markets every first and third Saturday near Seongsu Station Exit 1, where customers can buy quality shoes at low prices. Shoes that would be sold in department stores for 250,000 won sell here for 50,000 won or 60,000 won. People can shop for other leather goods like handbags, purses and accessories produced in Seongsu-dong. They can also enjoy several cultural events, shoemaking performances and student exhibitions. New projects are also in the making. Starting in October, Sujehwa Town’s factories will for the first time in Korea roll out GPS-based shoes to help track dementia patients. Next spring, they will also unveil similar shoes for children. Users can easily track the location of their child through their smartphones. 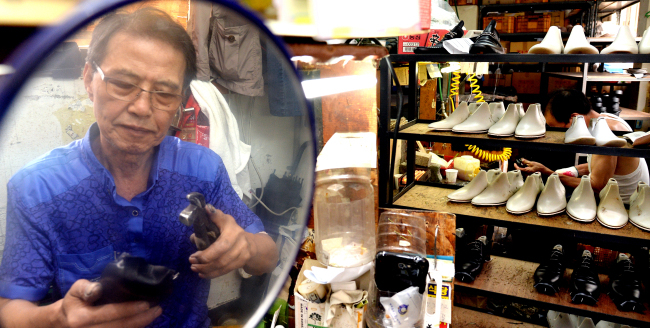 “I think the shoemakers’ skills here in Seongsu-dong are second to none even in the global market though most of them had no decent education. I hope we can reach more customers with our own brands,” Park said.